Google Tag Manager is an incredibly powerful tool – we use it daily to add all sorts of marketing and analytics tags for our clients. If you’re just getting started, we’ve put together a list of our Top 10 Tips for GTM Beginners. 1) Make sure the GTM code is installed on every page. A really useful tool to do this is Screaming Frog’s SEO Spider Tool. You can set up Custom Search Filters to find pages which contain any string of text in the source code (i.e. your GTM container ID) or for pages which don’t, so you’ll know exactly which pages have GTM installed and which are missing the code. 2) When you’re just getting started, remember to go in and enable all the variables you need by ticking all of the relevant selections. Otherwise, you won’t have access to ‘Click Text’, ‘Click URL’ and so on from the variable selection menus (and won’t be able to do much!). 3) Use the new (ish) Google Analytics settings variable. This means you won’t have to constantly enter your UA number when setting up new GA tags, reducing the risk of typos, but it also means any settings you enter will be automatically included for all GA tags going forwards such as Custom Dimensions, Fields to Set, etc. 4) Make sure that you know exactly who has access to your GTM account, and that more than one person in your organisation has access. It’s also a good idea to set up a generic email address and ensure it’s possible to log in to GTM with it. That way, if an admin leaves the organisation and their email address gets deleted and/or you don’t know their password, you’ll still be able to access your GTM account. 5) Use folders – if you’ve got a lot of tags/triggers, use GTM’s folder option to keep your container neat and tidy. 6) When publishing a new version, always leave notes so you know what’s been changed so you can always look back at the version notes should anything go wrong, you’ll know what you’ve broken and how to fix it! 7) Always test your new tags before publishing them! GTM has an awesome debug mode, so use it! 8) Another important thing to remember is that you need to have triggers set up for the relevant actions to be displayed in the debug pane – in other words, if you don’t have a click trigger in your account, you won’t see ‘gtm.click’ when you’re debugging. This is the same for gtm.linkClick (requires a link click trigger), gtm.formSubmit (requires a form submit trigger) and so on. 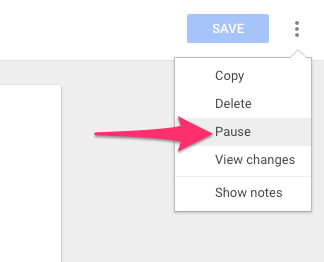 9) If you want to temporarily disable a tag, there’s no need to remove the trigger or add a blocking trigger, you can simply use the new ‘pause tag’ option. Don’t forget to publish your container again for the pause to take effect. 10) Remember to regularly back-up your container by exporting it and keeping it somewhere safe. You’ll always be able to back up again then should the worst happen. Do you have any other Top Tips for GTM Beginners you think we should’ve included? Let us know in the comments below!